You wrote of a growing strain on your spirit that seems to have no reasonable source, as your position is unobjectionable, your master provides you accommodations enough, and your annual fundraising goal numbers not unduly burdensome. What then? You ask if you are perhaps “a loser.” I think not. During my youth, my father — a fundraising titan who fought for funding alongside Major Donor — became disgusted with my inadequate Girl Scout cookie sales and sent me away to a notorious fundraising academy, one of the very strictest of the Transactional schools. I was miserable and branded a failure — a loser — at “working the room,” and “friend-raising,” and so on, until I was confined to the barracks for insubordination after I refused to ply my trade at a memorial service, trading donations for signatures in the guest book. But then I took a History of Fundraising in Western Civilization class. I learned about the Philanthropeon Wars. I learned about the lost city-state of Telethonika, where disability democracy had been born around the year 504 BC. 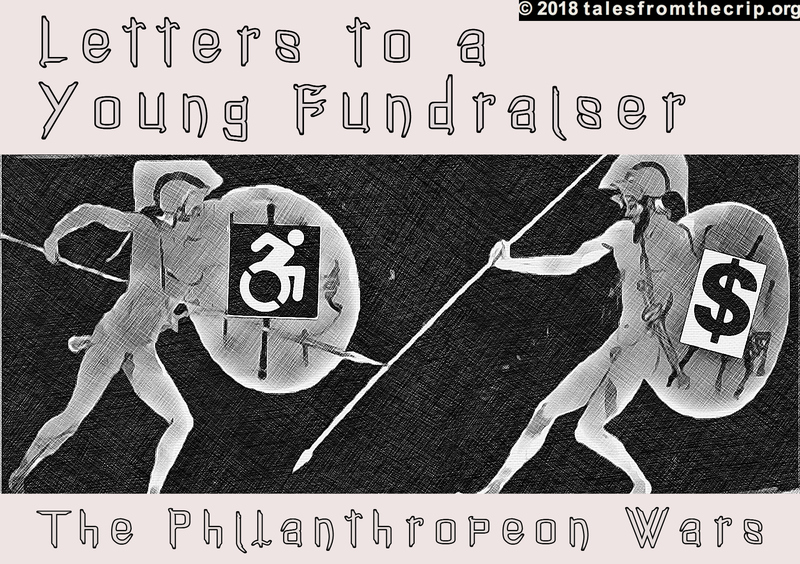 It is a loss that echoes down through millennia through some fundraisers who have the disability consciousness and who feel the shadow each year as Labor Day approaches. You may be feeling the echo of the fall of Telethonika, that flattish plain located one mountain over from Sparta. An earlier version of these remarks was shared at Congregation Beth Jacob in Redwood City, California on March 3, 2018. I deeply appreciated their welcome when I was invited to address their community by Anne Cohen, an activist, disabled parent, and board member at the organization where I am Director of Development, Disability Rights Education & Defense Fund (DREDF) or, as Anne has dubbed it, “the ACLU of disability rights.” CBJ’s cross-disability access allowed me to take the first step in organizing community support: communicate. I grew up with a disability, one that is genetic. I have been a plaintiff in an ADA access case here in California. It involved a bathroom. That required a lot of talking publicly about my using the bathroom. For disabled people like me – physically disabled — being disabled means never knowing where your next accessible public bathroom is. Today. Nearly thirty years after the ADA was passed. And keep in mind those 30 years coincide with my fundraising career in social justice non-profits and their philanthropic allies. Those are whole decades of trying my best to use empathy and imagination to shift that stubborn disability narrative that says I receive but can’t give. That disability is a health thing. That I need a cure when a toilet would be preferable. That I am charity, personified, not justice, denied. And she had made sure the door was locked. She stood there, watching the gray-blue paint and listening to what was happening from within. At first, nothing. Then a murmuring confusion, then a rapid rise in decibel levels, quickly becoming Frank’s singular baritone summoning Gretchen. It didn’t occur to anyone that it was anything but an accident. 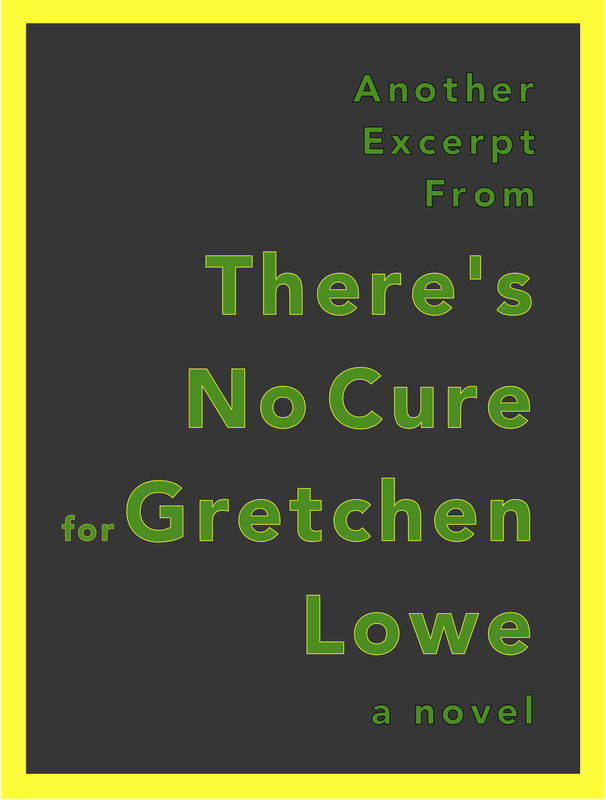 Alice’s schoolteacher handwriting greeted Gretchen when she flipped through the mail that evening. It was a floridly pious Mother’s Day card with a letter enclosed. Her mother must have sent it right after Gretchen had called about the board meeting fiasco. 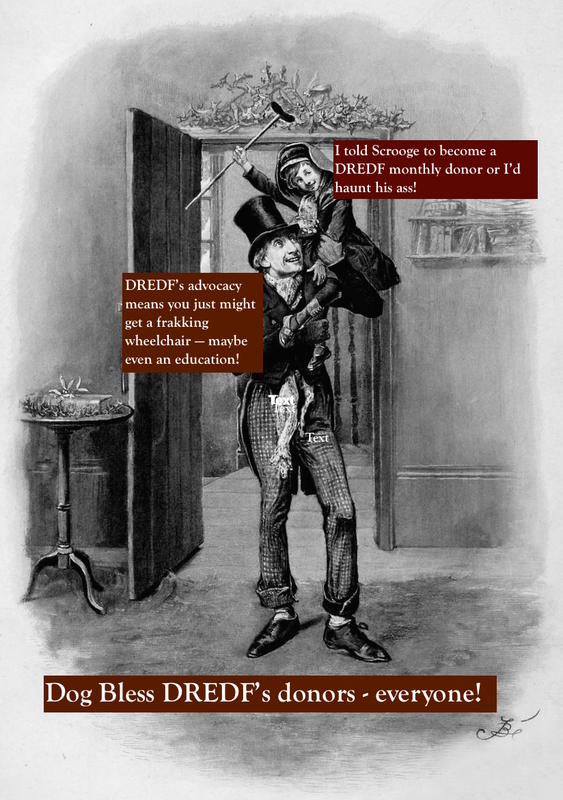 Oh Alice, Gretchen snorted pleasurably. I couldn’t have picked a better card myself. Underneath the card’s summary appreciation for maternal sacrifices, physical and emotional, Alice had written, “Thought you might like to see the enclosed item right now. I think it confirms that we are related. I cannot take credit for why you are who you are but I did have a hand in it. Then again, you were always a rotten child. Not that I had anything to do with that. Love, Mom. The letter was her mother’s same handwriting. Cheered, Gretchen set to reading it. It was dated from May 1970 and addressed to a Desmond Wallace, Chair of Fundraising Operations for the National Cerebral Palsy Association. Oh dear.